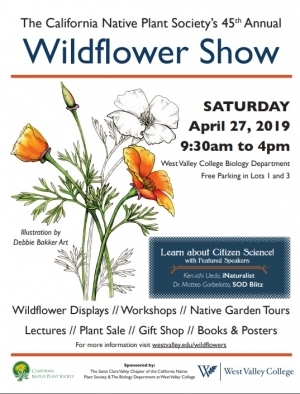 Please join us at West Valley College on Saturday, April 27th from 9:30 AM to 4 PM for our 45th Wildflower Show. This year, our theme is Citizen Science. There will be plenty of opportunities to learn how you can be a Citizen Scientist -- from macrophotography with your cell phone to tracking the spread of Sudden Oak Death to making your own observations with the iNaturalist app, there should be something for everyone! 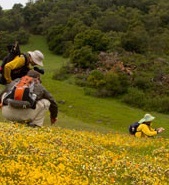 The show will feature hundreds of species of wildflowers and native plants from Santa Clara, San Mateo and surrounding counties. In addition to local plants, we will have a section featuring flowers from native plant gardens in our Chapter. Experts will be on site to describe different samples and answer questions. Conserve water and make your garden beautiful with California native plants. Bring habitat value and a sense of place to the garden. Our chapter nursery has year-round plant sales for CNPS members, and a public sale in the fall for the public. 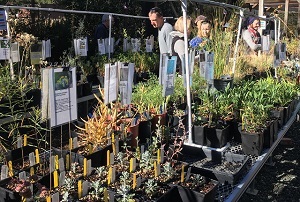 A current inventory is usually available the week of the sale at http://www.cnps-scv.org/images/stories/nursery/current-plant-list.pdf. Check the Events Calendar for the latest dates and times.